Autodesk Research prides itself on providing an open and encouraging environment for interns to participate and contribute to the research and publications from the various groups and projects. 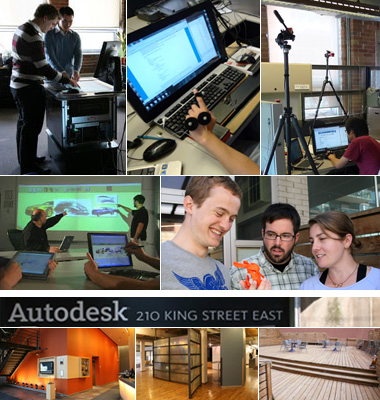 Come work at Autodesk Research! Autodesk research has a thriving internship program and we are always looking for bright and motivated researchers to join our team. Typically interns are graduate-level university students from areas of computer science which relate to our research interests. Our internship program provides students with an incredibly valuable opportunity to apply, broaden, and strengthen their own research skills, working closely with our team of experienced computer science researchers. We accept interns at all times of the year, and look forward to hearing from you. Over the last 20 years, Autodesk Research (formerly Alias Research) has been dedicated to providing a strong research environment striving to advance the fields of Computer Science. Based in downtown Toronto, San Francisco, New York, London and Shanghai the group is actively pursuing both academic and applied research goals in an open and friendly environment. Our work is being published at top-tier conferences, and has been integrated into products which reach millions of users. If you are passionate about doing exciting research, we encourage you to consider our current opportunities.